There are three rooms on second floor. 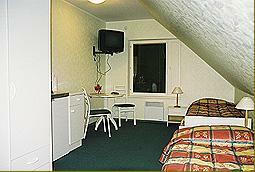 Room number 3: with one room; one king-size bed; TV set; mini-kitchen; water boil and coffee automat; WC; shower room. 2 places; possible to add one camp bed. Room number 4: with separate bedroom (without a door); one king-size bed and one sofa; TV set; mini-kitchen; water boil and coffee automat; WC; shower room. Room number 5: with one room; two beds; TV set; mini-kitchen; water boil and coffee automat; WC; shower room.